As I was perusing through the various spices at Costco, I found a spice that I had never seen before so out of curiosity, I picked it up to try it. 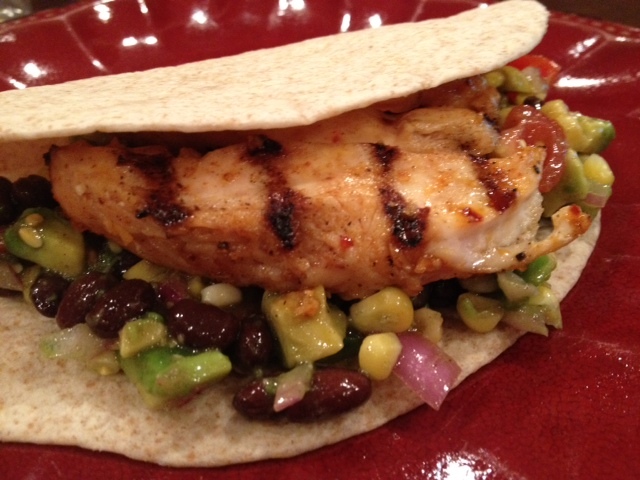 And chicken tacos is what I decided to make with it. 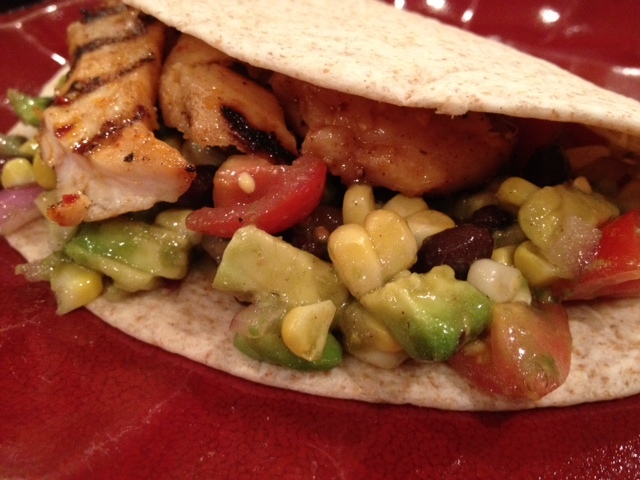 Recipe for 4: 2-3 chicken breasts, 1 avocado ripe but a bit firm, 2 ears of corn, 1/2 can of black beans, 1/4 cup of purple onion sliced, 1/2 cup of diced tomatoes, 2 tbsp of white balsamic vinegar, 4 tbsp of olive oil, 1/4 tsp of salt, 1/8 tsp of pepper, 2 tbsp of smokehouse Maple Costco seasoning. Turn the oven to 400. PLace one chicken breast on the roulpat, fold the roulpat back onto the chicken and with a rolling-pin, pound the chicken flat. Repeat the same with all the chicken breasts. Place the chicken breasts on a cutting board and with the paring knife, cut the chicken in slices of about 3/4 inch thick. Place the chicken in a bowl, add 1 tbsp of olive oil and 2 tbsp of the smokehouse herb blend and mix well to coat the chicken breast. 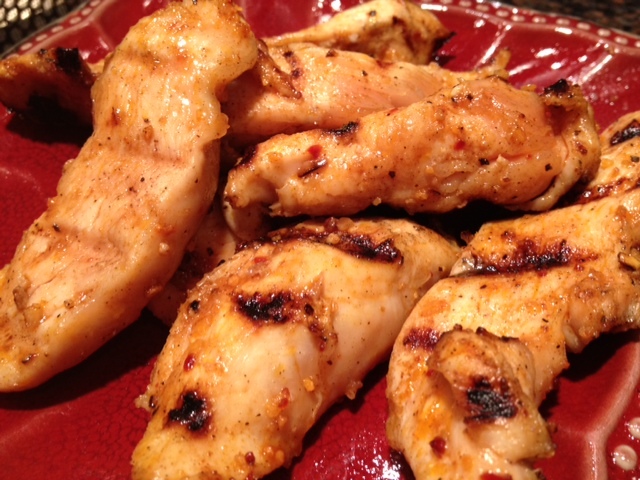 PLace the chicken onto a silpat and cook for 6-8 minutes ( or cook the chicken on the grill on high for 6-8 minutes as well). While the chicken is cooking, prepare the salsa. Place the 3 ears of corn in the large round mold, cover the mold with the octogonal silpat and cook in the microwave for 3 minutes. Remove the corn from the oven, let it cool and strip the corn from the cobb. 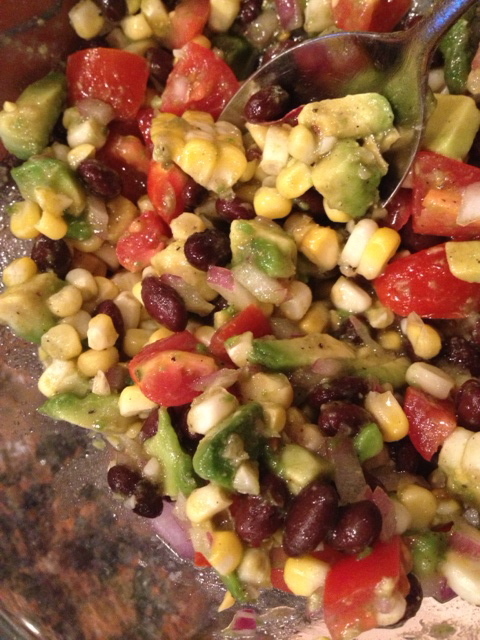 In a large bowl, place all the other ingredients ( tomatoes, avocado, beans, corn) and the dressing (2 tbsp of white balsamic vinegar, 5 tbsp of olive oil, 1/4 tsp of salt, 1/8 tsp of pepper) and toss. Warm up the tortilla for a few minutes ( 2-3) in the oven, and when they are ready, fill them up with the salsa and the chicken. YUMMY!!! !